Telinta again participated at PortaOne’s customer event in Chernihiv, where VoIP professionals from many parts of the world joined together. A team of highly-skilled engineers, developers, marketing and sales specialists represented Telinta this year. In previous year’s Telinta explained how PortaOne provides an excellent foundation upon which to build, showing examples of Telinta’s own custom development, such as its unique Virtual Office solution. 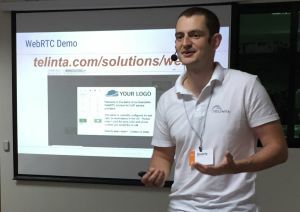 In 2018, Telinta discussed another unique example of its customer development, its WebRTC solution. Telinta’s WebRTC solution is a web-based softphone which enables end users to make and receive both on-net and PSTN calls via their own web browser, without any type of telephone equipment. The solution can be offered on a prepaid or postpaid basis, as a stand-alone offer or integrated with one of Telinta’s other solutions. Developed by Telinta, this brandable WebRTC solution has many attractive features and can easily be integrated into our customizable self-care end user portal. In June of 2017, Telinta returned to Chernihiv to attend a significant event hosted by PortaOne, where 350 VoIP professionals gathered together. In 2016, Telinta spoke about its custom development, explaining how PortaSwitch provides a high-quality platform to build upon. This year, Telinta focused on one specific example of custom development, its unique Virtual Office solution. Developed by Telinta, Virtual Office provides VoIP service providers a unique solution where end users can easily customize their own VoIP service “in the cloud” via Telinta’s self-serve portals. Navigating through a series of screens, end users can select their own features, DIDs, configure extensions, IVR and more. This solution is perfect for meeting the unique needs of small and home-based business customers. With Virtual Office, end users do not need to use IP phones, but instead can route calls to regular analog phones without an ATA, including their regular mobile phone line. Virtual Office’s self-service capabilities lets Telinta customers easily expand their VoIP business across the country or around the world, marketing online without installer visits or shipping phone equipment. In 2016, Telinta’s Virtual Office solution was awarded “Best in Show” at ITEXPO, a prestigious telecom industry event in the United States. PortaOne is the world’s leading provider of software for VoIP switching and billing. In Chernihiv, near Ukraine’s capital city of Kiev, PortaOne holds annual conferences to discuss important industry issues and innovative uses of its products. In 2016, over 200 telecom professionals from around the world gathered together to discuss important issues, trends and technology. The event was the most significant VoIP forum of its type to be held in Eastern Europe. Invited to present to PortaOne’s customers and team members, Telinta shared its experiences since 2002 developing innovative new switching solutions for VoIP service providers around the globe. Telinta discussed details on its full portfolio of hosted white label solutions, focusing on its own extensive custom development which complements Telinta’s own installation of PortaSwitch. Telinta owns and operates the largest deployment of Hosted PortaSwitch anywhere in the world. The key take-away of the day was that PortaOne provides very a flexible, high-quality foundation upon which custom solutions and unique tools can easily be developed.